Chicken diavolo is about the most flavour you can load into a dish. Big, bold Italian flavours. It’s so good. And its easy enough for a weeknight dinner. It’s not the authentic, old school chicken diavolo. Devil chicken. That’s peppery chicken grilled over a wood fire. Also crazy delicious but completely different. This is the other diavolo. One that’s become more popular in recent years. The original is great rustic eating. This is a bit rustic as well but you can dress it up. I do it all the time. This is one of those dishes that vary a lot from recipe to recipe. This version has lots garlic. It’s pretty heavy on the herbs. If that sounds good to you then maybe this is your chicken diavolo. The sauce is bright and lemony. But it’s also complex. The drippings from the bird and the herbs flavour it. Wine and stock round it out. Delicious stuff. Plate licking even. This is the first time I write down this recipe. I’ve made if forever, mind you. It’s based on a vague memory of a show I saw once. A cooking show starring this crazy singing Italian chef. He mumbled and he had this wicked accent. Never could understand him so this is probably not his chicken diavolo either. It’s mine. And now I hope it’s yours. 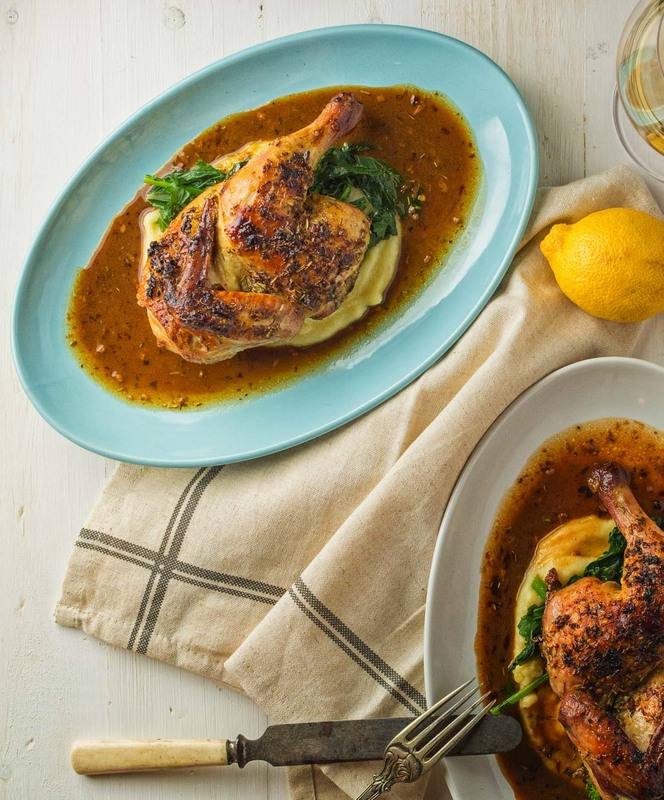 I use dry herbs in this recipe as you broil the chicken at the end. That blast of heat can cause problems. You have to be careful with the garlic. Fresh herbs wouldn’t stand a chance. I serve it here with parmesan polenta and rapini. Garlic mashed potatoes or pureed cauliflower would both work equally well. Set your oven up so one rack is in normal roasting position and the other is ready to broil. Pre-heat a large skillet capable of holding the two chicken halves in a 400F oven. Combine the marinade ingredients. You want to make a slurry. If it's too thick add a bit more olive oil. Place chicken in the skillet skin side up. Roast for 10 minutes. Remove skillet from oven and pour off the accumulated fat. Turn chicken over and add white wine. Roast for 10 minutes. Turn chicken skin side up again. Add lemon juice. Roast for 5-10 minutes - until an instant read thermometer reads about 160F. Remove skillet from oven. Turn on the broiler. When hot, broil the chicken to brown deeply, rotating the skillet as needed. Watch it closely. Don't let the garlic burn. Remove from oven and remove chicken from the pan. Place pan on heat. Add chicken stock and boil until reduced by at least half. Half the chicken halves (so you have two legs and two breasts) and serve with sauce. If you use regular sodium chicken stock decrease the salt in the marinade. This looks delicious, Romain! Perfect for Valentine’s Day or any other time you want a fancy looking dinner. Thanks for sharing! Thanks. It’s really not that much work. 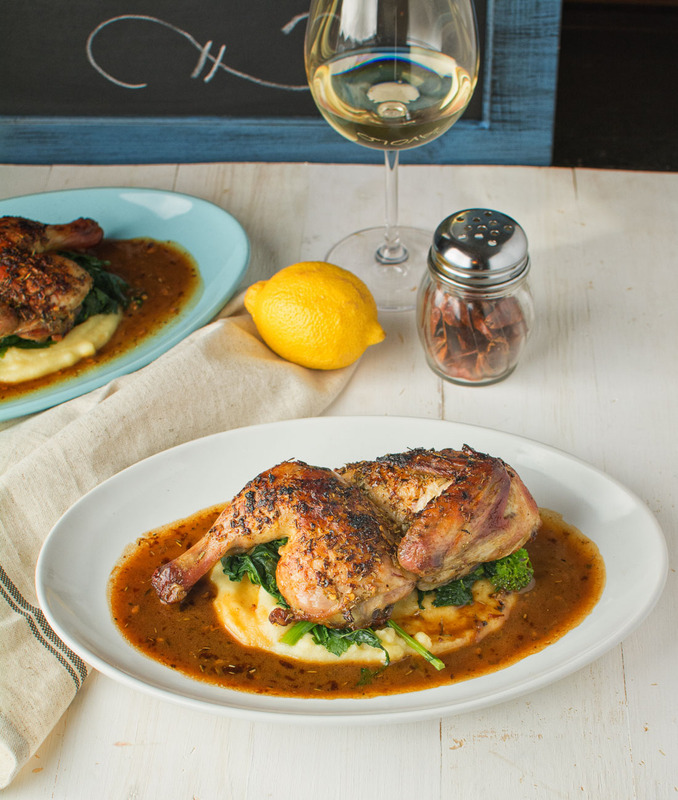 Skip the fancy sides and you can make this chicken on a weeknight. I love the sound of this chicken diavolo, it looks delicious, I’ve been addicted to using my cast iron skillet lately, and we eat more chicken than ever right now. Garlic and lemon are two of my favorite flavors. Not that I want to mess up a wonderful recipe, but what do you suggest I substitute for the white wine? I don’t usually keep it on hand, and traditionally I use chicken stock whenever a recipe calls for it. Thanks in advance! Erica, absolutely it would work if you left out the white wine. The wine adds a nice touch but the lemon, garlic and herbs are what drives the flavour of this recipe. Whole family raves about this dish! 5 stars!!! So glad you liked it. It’s been one of faves for a long time.